The Cowry Collective Film Series Continues This Month with Planeat! Join us for our FREE monthly film series featuring films centering on food, farms and justice. Bring a friend or a snack to share and earn cowries for attending! This month we feature: Planeat: The story of three men’s life-long search for a diet which is good for our health, the environment and the future of our planet – showcasing some of the best food you have ever seen. Planeat is a 2010 British documentary film by Or Shlomi and Shelley Lee Davies. 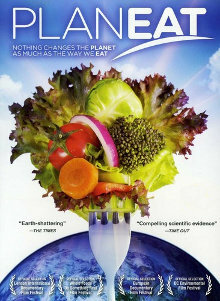 The film discusses the possible nutritional and environmental benefits of adopting a whole foods, plant-based diet based on the research of T. Colin Campbell, Caldwell Esselstyn and Gidon Eshel. By Cowry Collective|2015-12-09T16:34:00-05:00December 9th, 2015|Categories: Archives|Comments Off on The Cowry Collective Film Series Continues This Month with Planeat!